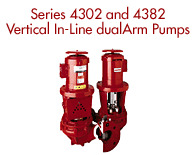 Armstrongs new dualArm vertical in-line pumps incorporate two Series 4300 or 4380 pumps in a single casing. Series 4302 is designed with split spacer type couplings, so that the mechanical seals may be serviced without disturbing the pump or motor connections, and is available with outside balanced or inside seals. Series 4382 is the economical close coupled design. Each type is supplied with a swing discharge port to hydraulically separate the casings to prevent recirculation when only one pump operates. Isolation valves enable one pump to be isolated for service or removal with the second pump still operating.